Other riders will tell you they think you look like a foot-dragging, newbie while riding the new Piaggio MP3. The two front wheels make it look as if your feet are constantly scuffing the ground. At least it does until you get to a stoplight, lock the front forks, and your feet are still up never having touched the ground. Just another small way you can entertain yourself, and others, with this scooter. Piaggio, from Italy, manufacturers and sells their own line as well as Vespa, Moto Guzzi, Aprilia and Derbi in North America. Vespa continues in the classic, traditional scooter style while Piaggio offers modern looks and innovation. 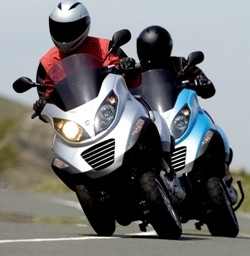 With the MP3, the innovation is found in the unique two-wheeled front suspension offering enhanced stability and braking. The two 12" alloy wheels are on their own independent leading link suspension with 3.35" of travel. 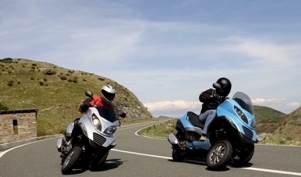 The link incorporates a small swing arm and non-adjustable shock absorber connected to its side of the fork, or steering tube as Piaggio calls it. Except for the two tires, the lower suspension looks much like a sidecar rig or an old BMW. Each wheel has a 240mm floating caliper disc brake and tires are 120/70, same size as the rear. The genius in the system occurs where the steering tubes and frame meet. Normally you would find a rigid triple tree clamp here. Instead, on the MP3, there are four pivoting aluminum arms, in a parallelogram configuration, supporting the two steering tubes. The pivoting action allows both wheels to stay in contact with the ground while leaning up to 40 degrees. Each front wheel independently soaks up bumps without any affect on its twin. A thumb switch on the right handlebar is used to activate an electro-hydraulic system to lock the arms from pivoting when stopped. With the forks locked, the scooter will remain upright. A sensor in the seat requires that you be sitting before unlocking the forks to keep the scooter from falling over. Another sensor requires that you be moving at less than 4mph before it can be activated. Any movement of the throttle will unlock the forks. Insurance restrictions prevented the SR! intern from testing whether the forks will automatically unlock while coasting down a hill. The locking forks are a bonus but not a substitute for people with handicaps; don't expect to ride the MP3 without putting your feet down. Except for the front end, the bike is similar to the Piaggio BV-series scooter line. The 250cc liquid-cooled engine is good for 22 hp at 8,250 rpm. An electronic fuel system feeds 91 octane fuel from the 3.2 gallon tank through a four-valve, SOHC head. A CVT, twist-n-go transmission sends the power to the rear wheel. There's even a clean-green, three-way, double catalytic converter to satisfy the environmentally conscious. I would have found it more useful to reverse the unlocking duties: I'd rather have the key wirelessly open the rear trunk instead of the seat. When coming out of a store it would have been handier to pop the rear trunk and stuff my purchases in the back and be on my way. My bulky Aerostich riding suit fits under the seat but the area is too shallow for a full-face helmet. Instead two helmet hooks are provided but not well placed: the seat could not be closed when attached to the D-ring of a Shoei full-face helmet. A GIVI trunk mount will soon be available that is said to allow access to the rear trunk and this will resolve the helmet storage issue. In Euro-style, a nylon cover is provided to protect the seat from the rain and elements, like the occasional seagull or crow for instance. Instruments include the analog tachometer and speedometer dials. The large numbers on the speedometer read in KMH and you may need to squint to read the smaller MPH markings. An LCD readout includes a clock (with date), coolant temp, odometer, 2 trip meters, and outside temperature. A handlebar mounted "Mode" button cycles through the trip meters and temperature reading. There are 10 idiot lights between the tach and speedometer. The largest of these is a bright yellow light for the fork lock. It flashes when the fork can be locked (low speeds or stopped) and is solid when the forks are locked. This light may distract you from the much smaller, lower placed, turn signal indicator. "But, wait, you're telling me that I need a sidecar license to ride this thing?!" "Right. It's got three wheels." Yes, because the MP3 has three wheels you will need a Sidecar/Trike Endorsement to legally ride it in Washington state as well as others (check with your local department of licensing). At least for now. We know Department of Licensing employees are testing the MP3 and trying to figure out how to adjust the licensing regulations to fit this machine. How to get the endorsement? You can either take the $100, 3-day course through the Evergreen Safety Council . The 3-day class is oriented towards people with no 2 or 3 wheeled experience. Once you pass the written portion you have 90 days to schedule and take the riding test. The Bellevue and Kirkland DOL offices handle scheduling for alternate weekends. You'll be calling back and forth between the two offices trying to find a date. As of the end of April all spots are filled through June and they aren't scheduling for July yet. Let's hope licensing requirements for the MP3 are adjusted soon. "Okay. What endorsement do I need if I put a sidecar on the MP3?" During most riding it handles like any other scooter. I noticed mild resistance when first starting to turn but this was an advantage at very slow speeds in town. The bike is incredibly stable pulling up to lights; you'll be one of the last to dab your feet at a light even if you don't cheat and lock the forks. At higher speeds it transitions slower into turns than other scooters but, boy, it can be leaned WAY OVER and it tracks well through the turns. The front end is well-planted and rock solid. I tried hitting a speed bump with just one tire. I thought that the off-center hit might jerk the handlebars to one side. No problem, there was little difference between the MP3 and a two-wheeler. However, you may lose the normal two-wheel advantage of avoiding speed bumps by squeaking through small openings. Strange to hit a speed bump with the front but the rear wheel misses it. The MP3 adds a layer of security in winter urban commuting with rain-slick utility covers, pavement markings, and railroad crossings. Riding along old streetcar tracks and need to change lanes? You'll barely notice them. Just discovered, at 30 mph, that a familiar street has been reduced to loose rubble since this morning? Feh, ride on through. The brakes are absolutely phenomenal. You'll rarely find dual front discs on a 250 cc scooter; the MP3 arrangement requires them on each wheel. With twice as much brake and twice the traction as a similar machine you will find them strong and predictable. I had one exciting panic stop caused by a cager (hang up and DRIVE!!) but even that incident put a smile on my face after grabbing the brakes. Completely awesome. A jaywalking zombie wanders into your path? The two massive front brakes will stop you in an instant. The brake feel will allow you to determine precisely just how much room to give that zombie, too. The power and acceleration was not so awesome but is adequate. There is a stop sign on Yesler just west of the I-5 overpass. A 362 lb. (dry) Big Ruckus, when new, will barely accelerate up the hill from that stop. The 450 lb. (wet) MP3 had no such problem. I had no trouble keeping up (or ahead) with most vehicles in the stoplight drag-race of my commute. The MP3 will maintain 65 mph in freeway traffic but no 250cc scooter is designed for interstate cruising. At 6'1" I found the seating position a bit cramped. I prefer a feet-forward riding position and that is not available on the MP3. At least the seat was comfortable even after a 170 mile day ride. The pudgy handlebar covers block the edges of the speedometer and tach and, from my position, I found it difficult to see the lower idiot lights including the "Trunk Open" warning light. At $6999, the Piaggio MP3 has to be one of the most expensive scooters, per cc, on the market but cutting-edge technology is never cheap. If the price doesn't bother you, then dig in - the MP3 is an excellent, all weather, urban commuter from one of the world's largest, and oldest, scooter manufacturers.